Power Ops is a great place to hold your next private or non-private event. We have parking for hundreds of cars, large scale fields, and trained staff to make any event a success. Please contact us if interested in a private event. We also host birthday parties and private games for large groups on our normal open days too. 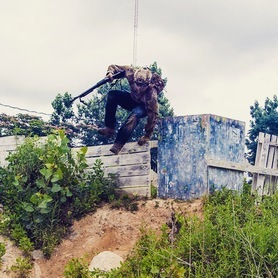 Be it Airsoft, Paintball, or Laser Tag, we will make sure your group has a blast! We also host film locations and other private functions with our facility too. Contact us to find out more. Power Ops offers numerous packages for various groups. Birthday party airsoft events for all ages (10+). We also offer corporate team building events with airsoft guns. If you and your team want to rent the facility for a private event, we cater to that as well. Contact us with the number of people you're interested in having, number of rental packages, and if you need extra referees for your event. We have rental gear for all new players. Groups and Birthday parties will be mixed in with other regular players. If you want your own referee and private games, there is an additional referee fee on top of regular group rates, depending on the amount of players. If you're interested in a private event, use the 'contact us' form on the contact page or book online with the above options requested. We will get back to you ASAP. ​﻿Ages 10+ for private parties! Prices start at $25/player for groups of 15+, which include dedicated staff and organizers for your party. Parties are for weekends only. You can bring your own food and drinks. ﻿Our giant modular 'killhouse' features breachable exterior doors and movable interior walls. A catwalk above offers a bird's eye view below for instructors. Contact us for more info on our facility rentals for police or private tactical use.